The events on September 11, 2001. The bombing at the Boston Marathon. While many prefer not to think of these tragic events every day, there are students and faculty at Mississippi Public Universities who study these issues, with the goal of keeping everyone safe. The U.S. Department of Homeland Security recognizes Mississippi's capabilities in this arena, supporting work at Jackson State University, Mississippi State University and The University of Southern Mississippi. Jackson State University received a $589,000 Scientific Leadership Award to bolster its Emergency Management Technology program. The grant will fund collaborative interdisciplinary efforts to promote and encourage undergraduate students to pursue a bachelor's degree in Homeland Security-related Science, Technology, Engineering and Mathematics (HS-STEM) field. The EMT program is designed to ensure that students have the skills needed to manage a crisis. After a rigorous and highly competitive review process, the U.S. Department of Homeland Security selected Mississippi State University to lead a major research and development project on the use of drones. The DHS Science and Technology Directorate (S&T) selected Mississippi as the new base of operations for small unmanned aircraft systems (sUAS), commonly known as drones, with a Mississippi State-led partnership overseeing the initiative. The DHS S&T Small Unmanned Aircraft Systems Demonstration Range Facility supports homeland security operations and training by providing UAS flight and exercise support facilities to support operational evaluation of UAS in a variety of applications and scenarios. The Mississippi Partnership includes the Mississippi National Guard's Camp Shelby Joint Forces Training Center, the Mississippi Air National Guard's Gulfport Combat Readiness Training Center, NASA's Stennis Space Center, the Jackson County Port Authority and the Hancock County Port and Harbor Commission. All planned exercise events will incorporate small UAS to assist DHS in monitoring and assessing the simulated scenarios over both land and water. The DHS designation further enhances the state and MSU's growing unmanned aircraft research and development portfolio. In 2015, after a similar competitive review process, the Federal Aviation Administration selected the MSU-led Alliance for System Safety of UAS Through Research Excellence (ASSURE) to operate a new national center of excellence for unmanned aircraft systems. The State of Mississippi joined the Pan-Pacific UAS Test Range Complex - one of seven of the FAA's UAS test sites. Mississippi State University has also been designated as a Center of Academic Excellence (CAE) in Geospatial Sciences by the National Geospatial-Intelligence Agency (NGA) and the U.S. Geological Survey (USGS). Geospatial sciences inform decisions on national security, military planning and operations, homeland security and disaster management, earth sciences, and global security issues in energy, health and the environment. A key component of the CAE designation is encouraging student research. Since 2012, faculty and student collaborations have resulted in peer-reviewed journal publications on glacial retreat and climate change, forest management, wildfire risk prediction, and hurricane damage predictions, among others. While the geosciences department is a hub for geospatial education and research, many additional credit hours are available campus wide in the College of Forest Resources, the departments of Plant and Soil Sciences, Agricultural and Biological Engineering, and Electrical and Computer Engineering. The university also offers a geospatial and remote sensing certificate program on campus and online. 30-seat and 10-seat labs running GIS and remote sensing (RS) software. Two additional servers housing "thin-client" versions of GIS and RS software used for distance learning geospatial coursework. MSU's Geosystems Research Institute, a top 10 parallel computing environment with a full suite of GIS and RS software. Two GIS labs with a total of 52 machines in the forestry department. Delta State University students also learn how to address problems from a geographic perspective in the Geospatial Information Technologies (GIT) program, which encompasses the use of geographic information systems, remote sensing, global positioning systems (GPS), and spatial analysis techniques. The program provides in-depth education about the theory, ethics, and practice of GIT, combining classroom training with real world experience through cooperative education. All students in DSU's GIT program, whether pursuing a certificate program or a master's degree, are required to conduct real-world work prior to graduation. While some choose to pursue projects related to their place of employment, many others work with partners at local and state government, the National Geospatial Intelligence Agency, US Marine Corps, Mississippi Emergency Management Agency, the United Nations, among others. In addition to training the next generation leaders in the field, GIT serves government agencies, private businesses and non-profit organizations and helps them understand and make informed decisions on a wide range of issues. Knowledgeable use of GIT helps with a host of real-world problems ranging from the routing of a fire truck to the scene of an emergency, to establishing our representation in Congress, and determining how much property tax is paid. The U.S. Department of Homeland Security also provides grants to The University of Southern Mississippi's National Center for Spectator Sports Safety and Security (NCS4), the nation's only research center devoted to the study and practice of spectator sports safety and security. Established in 2006 to respond to the nation's emerging security needs, NCS4 is a cornerstone in the scholarship arena as it represents USM's innovative approach to research, training, and development. Combining operational perspectives with collaborative research and education, the Center contributes expertise in translating lessons learned into best practices, professional competencies, research and capacity building, and tested and validated technology solutions in safety and security. An international research and education center for sports safety and security, the NCS4 collaborates with professional sport leagues and venues, intercollegiate and interscholastic athletics, marathon and endurance events, and international sporting events along with professional associations, private sector firms, and government agencies. The Center's partnerships bring together subject matter experts from government, industry, public safety, private enterprise, and academia to explore lessons learned and share ideas about best practices, strategies, training and certifications, and technology solutions for sport safety and security challenges. The NCS4 develops and deploys practical tools, applications, and skills that bolster the capacity of practitioners to respond effectively to new and future safety and security challenges and issues. A security arena that continues to come to the forefront, cybersecurity is an issue that plays an increasingly larger role in homeland security. 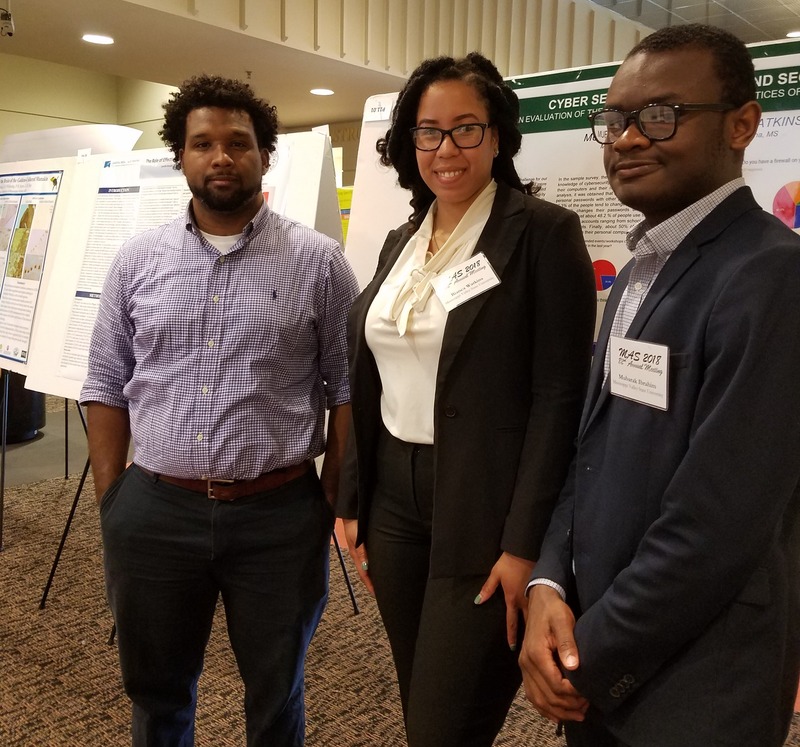 Two Mississippi Valley State University students presented research that explores the relationship between cybersecurity and homeland security during the Mississippi Academy of Sciences (MAS) Meeting that was held recently at the University of Southern Mississippi in Hattiesburg. MVSU students Bianca Watkins, a criminal justice major from Plainfield, Ill., and Mubarak Ibrahim, a mathematics, computer and information systems major from Nigeria, conducted the research with assistance from MVSU Assistant Professor of Criminal Justice Dr. Alaba Oludare and Instructor Christopher Lanclos of MVSU's MCIS Department and Cybersecurity Center. The research was supported by funds awarded by the Charles Koch Foundation, under the direction of Dr. Emmanuel Amadi, chair of MVSU's Criminal Justice Department. In an effort to evaluate homeland security, the research team performed a case study on the MVSU community to assess awareness of cyber threats. The findings of the survey were then compiled into a poster presentation showcased during the meeting. Watkins and Ibrahim were on-hand to provide additional insight of the findings to MAS members. Homeland security is an important issue in uncertain times. Mississippi Public Universities are advancing the body of knowledge that will make measures taken to keep the public safe more effective. 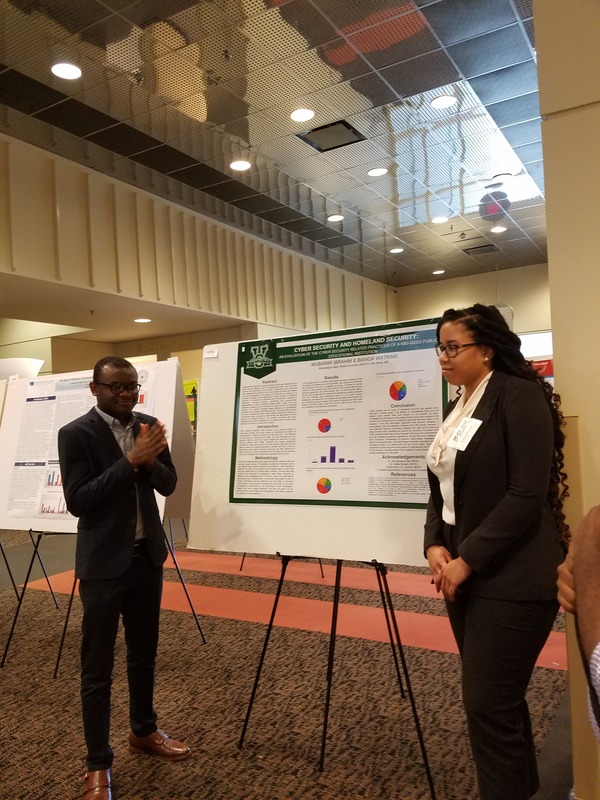 Pictured, from left, MVSU Mathematics, Computer, and Information Systems (MCIS) major Mubarak Ibrahim of Nigeria and Criminal Justice major Bianca Watkins of Plainfield, Ill., recently presented during the Mississippi Academy of Sciences (MAS) annual meeting on the topic, "Why Cybersecurity is Essential to Homeland Security." Pictured, from left, are Christopher Lanclos of MVSU's MCIS Department and Cybersecurity Center; Criminal Justice major Bianca Watkins of Plainfield, Ill.; and Mathematics, Computer, and Information Systems (MCIS) major Mubarak Ibrahim of Nigeria.